The basic premise of this course is that athletics were a central social activity in many ancient societies, but especially in the Greco-Roman world and athletics illustrate values and attitudes upon which ancient societies were based. Ancient sports were generally part of public celebrations, almost always religious in nature, but sometimes commemorating political events or the funerals of famous individuals. Ancient athletic events honored not only the athletes themselves but also the gods and society as a whole. In Greece, especially, athletics served to define an individual or community as Greek as opposed to barbarian. Arete, the Greek concept of excellence, was central to ancient Greek athletics. The material prizes won in competition were considered a physical emblem of this excellence. 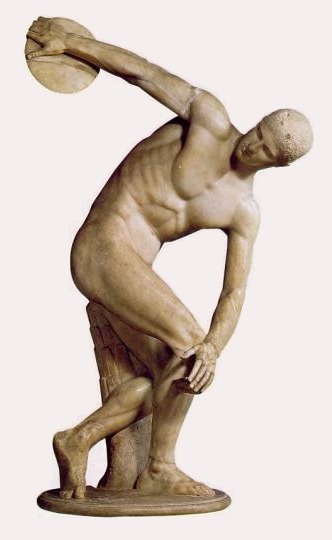 Modern athletics, especially in the context of the modern International Olympics, has idealized ancient Greek athletics and claims to use the ancient Greek Olympics as a model. Roman athletics, on the other hand, is associated today with the gladiatorial amphitheater, with violence and cruelty, and with persecution of Christian martyrs. In this course we will examine and evaluate these stereotypes and models in the context of the ancient reality. What were ancient athletics really like? What were the actual rules and events? What values drove ancient athletes to succeed? Inevitably, the study of the ancient sports inevitably confronts us with attitudes and social structures different from our own and puts contemporary attitudes about sports in a more historical and universal perspective. This material has been published on the web by Prof. Tom Sienkewicz for his students at Monmouth College. If you have any questions, you can contact him at toms@monm.edu.